Mila thinks she’s a regular girl but then she discovers that she is, in fact, an android, and her mom is her creator. Then a few evil guys find out where they live and they have to run away. But then they are found by the organization that created Mila, and taken back to the lab where she was created. Mila’s mom is captured, and Mila has to perform 3 tests to prove that she has no emotions. She fails all of them, and manages to escape the facility just before they can kill her and her mom. Unfortunately, Mila’s friend Lucas is shot and her mom is killed. Then Mila calls her “boyfriend” Hunter to help her, because she’s stupid. Mila and her mom have been living in Clearwater since her father died in a fire. However, Mila has no memories of the fire, and the memories of the rest of her life are pretty much a blur. Oh boy. When new guy Hunter moves to town, Mila immediately likes him. Unfortunately, so does her friend Kaylee. Mila goes home and her mom tells her that she is, in fact, an android, and her mom is her creator. She has stolen Mila (the MILA 2.0 android) from the military organization she worked for, because Mila was too human and Mila’s mom/creator thought that she deserved to live. Mila is upset and tries to hide from her mom and goes on a date with Hunter (who Mila already seems to love). When she comes home, she finds the house completely wrecked. Her mom is being held captive in the garage. But thank goodness Mila is a fighting machine (literally) and she takes them all out. Mila and her mom run away and they get pretty far. In a motel, two mysterious guys attack them but Mila takes them out because she’s awesome. They get all the way to Canada and plan to fly to Europe. At the airport, Mila decides it’s a good idea to call Hunter. While she’s on the run. SUCH A GOOD PLAN! Anyway, people at the airport suddenly realize that Mila is made of METAL so she can’t really go through airport security. Mila and her mom run through the airport, jump off a building, steal a car and race around. It’s pretty awesome until they get caught. They are taken to a hidden building in a cave near Washington DC, where Mila meets her other creator, General Holland, a sort of intern Lucas and her “sister”, Mila 3.0, who is just like Mila but less human. 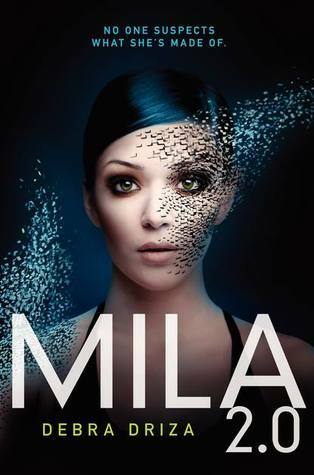 Mila’s mom is imprisoned and Mila is given three tests to see if she’s “android enough” to stay alive. Androids with emotions are liabilities. If she can’t be trusted, she’ll be destroyed, which is not fun. For the first test, Mila has to beat Three (Mila 3.0), and she succeeds using her humanity. The second test is that Mila has to look all robot-y while Holland tortures Lucas, with whom Mila has formed a bond. (They’d be cute together, just sayin’.) She can’t show emotion, but instead she gets seriously pissed and takes it out on Holland. She’s just awesome. For the third test, Mila and Three have to go through a fake village full of obstacles and traps to retrieve some kind of cilinder. Meanwhile, Mila’s mom is in a seperate room which is set on fire. Mila almost beats Three, but at the end, her mom is nearly burned and she leaves the test to rescue her mom. That was not the right response, obviously. Holland decides it’s best to kill Mila the next day. But then LUCAS shows up to take Mila to her mom and escape with them because he’s awesome. It’s too bad he’s shot (not dead) before they have the chance to leave, but eventually, Mila and her mom make it out. They steal another car and drive through DC to escape the cars following them, but just as they’re about to escape, Mila’s mom is shot and dies. Before she died, Mila’s mom told her to find someone who can help her find answers. (I am very sorry but I don’t remember this name, even though this is a recap.) So this is Mila’s goal for the next book. But THEN Mila is stupid enough to call Hunter, who she knows absolutely nothing about still, to help her because she’s all alone. They meet in a café. The end.